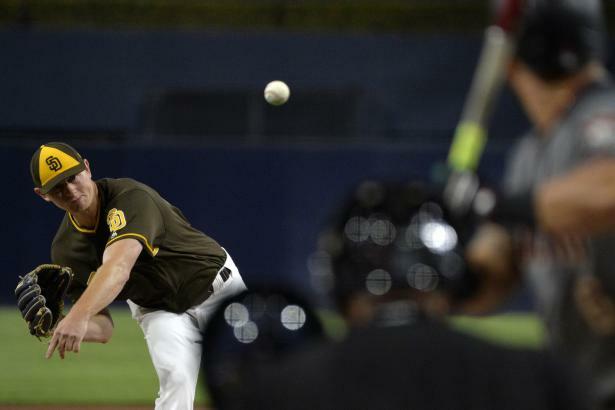 Thanks to a boatload of young talent and a fairly aggressive front office, the Padres look to be pulling out all the stops to advance their competitive window. And while adding an arm from outside the organization is still an option, there are a few internal candidates who could help them take the next step. Despite never having pitched above Double-A entering 2018, Joey Lucchesi (LHP, SD) got the call early in 2018, riding his deceptive delivery and three-pitch mix to a 4-3 record and 3.26 ERA in his first 12 starts, then struggling a bit (4-6, 4.75 ERA) in the second half. As noted by Stephen Nickrand here though, Lucchesi’s 2H skills (10.6 Dom, 12% SwK, 2.5 Ctl, 60% FpK) point to some upside lurking beneath the surface. Eric Lauer (LHP, SD), too, will be looking to build on his late-season success. Lauer scuffled in his first 13 starts (5.08 ERA, 5.06 xERA, 7.8 Dom), but after unveiling a new cutter (~15% usage) in July, he went on to produce a 3.42 ERA (4.19 xERA) and 8.3 Dom while upping his SwK from 8% to 10%. He was especially strong upon return from an August forearm strain, allowing just 3 ER in 25 IP (25/9 K/BB) over his final 5 starts. Another interesting option is Robert Erlin (LHP, SD), who after rehabbing from TJS in 2017 spent much of 2018 working out of the bullpen. He did close out the year in the rotation, though, and while his 6.23 ERA across a combined 12 starts seems ominous, an unsightly 54% S% in those starts certainly didn’t do him any favors. His control (1.0 Ctl) is elite, and his season-long 3.63 xERA gives reason for optimism. An open question at this point is the role of 2018 swingman Matt Strahm (LHP, SD), who spent the season’s first month recovering from 2017 knee surgery. The 27-year-old worked in a multi-inning role and made a few nominal starts, flashing a 2.05 ERA (3.73 xERA) and 10.1 Dom (13% SwK) in his 61 innings. The swing-and-miss stuff isn’t terribly surprising, while the drop in walks—from 5.7 Ctl (59% FpK) in ‘17 down to 3.1 Ctl (66% FpK) in ‘18—is what really paints an intriguing picture. Finally, keep an eye on Chris Paddack (RHP, SD). Paddack enters the year at #32 on the HQ100, and there is some speculation that his debut may come sooner than expected. He amassed 90 IP across two levels (topping out at Double-A), with a combined 2.10 ERA and eye-popping 120/8 K/BB ratio. His mid-90s fastball and elite change-up could make him an impact SP right out of the gate. With the December signing of Daniel Murphy (2B, COL), the current thinking is that Ian Desmond (1B/OF, COL) will move back to center field, where he last played regularly in 2016. Offensively, Desmond’s fifth career 20/20 season received relatively less fanfare thanks to a .236 BA (.269 xBA) and whopping 62% GB%. Maintaining that SB total won’t get any easier as he enters his age-33 season, but his sizable contract should afford him plenty of leash to work through any struggles. The two corner-outfield spots will likely be filled by Charlie Blackmon (OF, COL) and David Dahl (OF, COL). Blackmon will try to add to his 2H success, where he hit .311 (.289 xBA) with 15 HR and 7 SB. Dahl, meanwhile, will look to deliver on the considerable offseason buzz (NFBC ADP = 69.28) fueled in part by his mammoth September (9 HR, 27 RBI in 84 AB). There figures to be plenty of moving parts in Colorado this season, and second baseman Garrett Hampson (2B, COL), covered here a few weeks ago, could be an option to fill in at center field. Raimel Tapia (OF, COL) has little left to prove at Triple-A, hitting .302/.352/.495 with 11 HR and 21 SB in 2018 alone, and his defense/speed profile could eventually land him in the COL lineup. So far, in his 223 MLB at-bats, Tapia owns a .274 BA (.259 xBA) and mediocre plate skills (5% bb%, 76% ct%), but his speed and developing power would make him extremely enticing if he were to garner full-time at-bats. Perhaps on the outside looking in, at least at this point, is Mike Tauchman (OF, COL). The 28-year-old lefty enjoyed Triple-A pitching to the tune of .323/.408/.571 last year, but his lack of efficiency on the bases (12-of-22 on SB attempts) suggests to temper expectations in that regard. He has gotten very limited looks in the past two seasons—27 AB (2017) and 32 AB (2018)—striking out in 25 of those 59 at-bats, but could nonetheless be worthy of a look at some point this season. The Dodgers are still rumored to be in the mix for J.T. Realmuto (C, MIA), which would of course drastically alter the current playing-time situation behind the plate. As it stands, however, the plan would appear to include a two-headed monster of Russell Martin (C/3B, LA) and Austin Barnes (C, LA). Martin is coming off a year with the Blue Jays in which he failed to hit above the Mendoza line for the first time in his career. His plate skills (16% bb%, 72% ct%, 0.68 Eye) weren’t too far off previous levels, but fewer line drives (14%) and a 23% h% really dragged him down. As noted in the Baseball Forecaster, it’s hard to see much upside in the 36-year-old’s profile. Barnes, meanwhile, will be looking to rediscover his contact-making ways. Entering last season, Barnes had gained a good deal of buzz thanks to his impressive 2017 (.289 BA, .295 xBA, 8 HR and 4 SB in 218 at-bats). But a spring elbow issue slowed him early on, and he never really got going (67% ct%) despite generally above-average plate skills in the minors. He works well with the pitching staff and also offers some positional flexibility, making him an intriguing bounce-back candidate with enough playing time. Beyond that, the future at the position is bright, as the team has two potential impact players—Keibert Ruiz (C, LA) and Will Smith (C, LA)—honing their craft in the minors. Ruiz enters the year at #30 on the HQ100, receiving an 8B rating in the Minor League Baseball Analyst. Ruiz has good plate discipline and a line-drive approach, with a strong and accurate arm behind the plate. Smith, on the other hand, ranks as the team’s #5 prospect, three years older and more polished defensively than Ruiz. Smith struggled in his first taste of Triple-A last season, but offers an above-average power profile for a catcher, albeit with some swing-and-miss issues that will need to be addressed if he figures to push for MLB playing time in 2019. There was some speculation that the Giants had an interest in DJ LeMahieu (2B, NYY) prior to his signing with the Yankees, which, if true, gives an indication of how they see their current 2B situation. Joe Panik (2B, SF), an All-Star in 2015 and Gold Glove winner in 2016, hit a lowly .254 (.271 xBA) across 358 at-bats last season. His hard-hit ability (105 HctX) stayed intact, but unfortunately many of his balls in play were hit on the ground—as evidenced by his 48% GB%. Those hoping for a rebound will want to look to injuries (thumb, groin) that cost him time at different points in the season, and also the fact that his already-elite ct% (career 89%) reached a career high (92%) in 2018. Still just 27, he’s not to be completely written off just yet. Filling in during Panik’s absence last year was Alen Hanson (2B/OF, SF), a 26-year-old switch-hitter who joined the Giants prior to last season. Hanson burst onto the scene with 4 HR and 3 SB in just 47 AB between April and May, but his contact skills slowly began to fail him, as he walked at just a 2% clip in the second half. Contact wasn’t the only issue, as HctX (58) and xPX (30) also took a dive over that timeframe. With 20 SB in 27 attempts (74%) across three MLB seasons (542 AB), Hanson's speed figures to be his most likely path to becoming a fantasy asset. To add depth at the position, the team acquired Breyvic Valera (2B, SF) from the Orioles earlier this month. Valera made his season debut with the Dodgers last year before being traded midseason, and across 64 AB managed just a .234 BA (.211 xBA), 0 HR and 1 SB. His near-.300 BA in the minors is nice, as is his positional versatility, but the overall package lacks much offensive upside for fantasy purposes. With the departure of last year’s saves leader, Brad Boxberger (RHP, FA), manager Torey Luvollo indicated earlier this offseason that Archie Bradley (RHP, ARI) would likely enter the season as the front-runner for saves. Bradley, a former top prospect, has been seemingly on the cusp of grabbing the closer’s role ever since transitioning to the bullpen in 2017. Since making the switch, his walks have continued to drop, reaching a career-best 2.5 Ctl (68% FpK) last year—and his 9.6 Dom has been passable, if unspectacular. One thing worth noting is that Bradley struggled with a cracked fingernail during the 1H, causing his curveball to be less effective. This, along with the midseason introduction of a ~96 mph sinker, gives some hope that the 11.0 Dom (11% SwK) he flashed in the 2H can stick. If Bradley were to falter or get traded, one potential replacement candidate would be Yoshihisa Hirano (RHP, ARI). Hirano nabbed 3 saves last year when taking over for the aforementioned Boxberger. Despite a shiny 2.44 ERA though, Hirano’s velocity (91.4 mph) and strikeouts (8.0 Dom) were not exactly impressive, and he enjoyed some good fortune with a 25% H% and 82% S%. His groundball lean (50%) and SwK (13%) are enough to keep him on the radar though. One interesting name to monitor is Yoan Lopez (RHP, ARI). Prior to his 9 IP with the big-league club in September, the 26-year-old Lopez had never pitched above Double-A, where he posted a 2.92 ERA (87/26 K/BB) in 62 IP in 2018. Lopez continued to look the part in his small-sample MLB debut, striking out 11 while walking just 1, showcasing his elite velocity (97 mph) along with a wipeout slider.